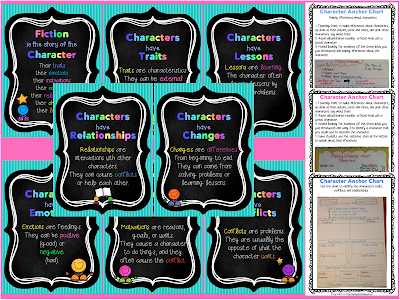 Biography Study: fun ways to conclude our unit! I think I have made a groove in my couch with my ample bottom. I've binge-watched Dexter on Netflix (because I'm all caught up on Law and Order SVU). I've consumed cup after cup of delicious coffee, pretending that using Splenda instead of sugar is healthy enough. I pour in the Splenda with my left hand, and with my right, I sqoodge on the whipped cream. Sometimes I carry a few marshmallows with me for good measure, in case the whipped cream melts and there's still more coffee left. Ooooh! I just had an idea! I can sprinkle cinnamon on the whipped cream! YEAH! Don't judge me. It's November. 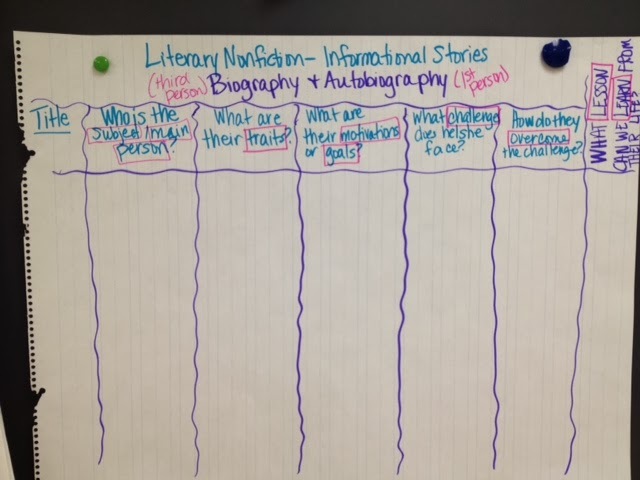 This November, many of our grade levels worked on teaching literary nonfiction, specifically, biography. 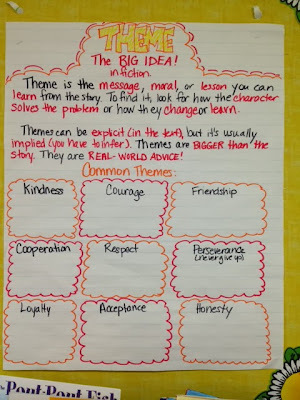 We taught the elements of the genre and explored them in a few texts. After creating a matrix, our teachers were ready to wrap up the unit the week before Thanksgiving. 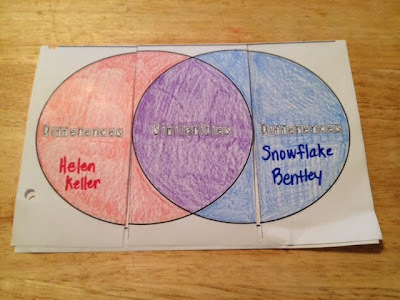 One great way some of our grade levels had students demonstrate their learning was this folded flap book about Snowflake Bentley. 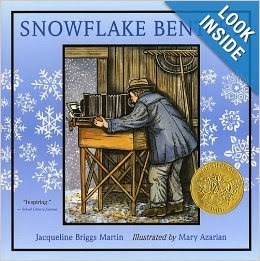 I love Snowflake Bentley - he's such a great person to read about and contributed so much to science! 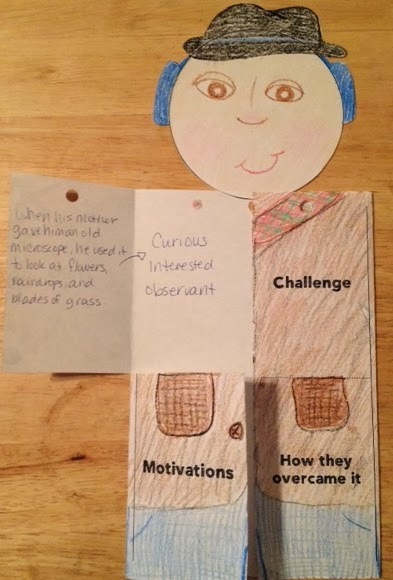 This little folded flap book documents his traits, motivations, challenges, and how he overcame his challenges. 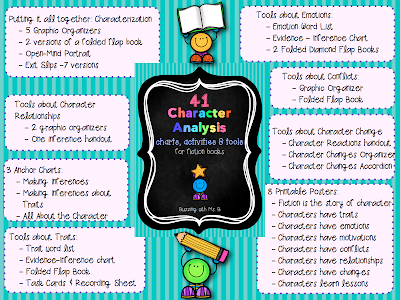 You can find it in my 41 Character Analysis Tools Pack, new to TPT! 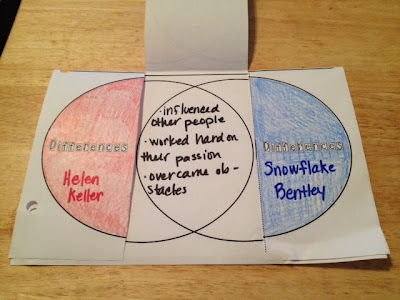 On the outside, we illustrated Snowflake Bentley. On the inside, we wrote the text evidence and the inference we made about him. 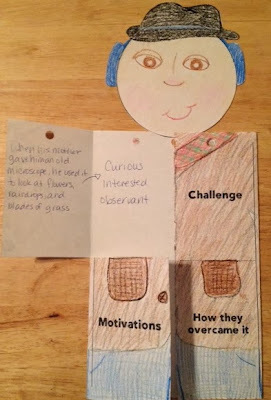 The way we wrapped up our unit in the fifth grade was by making connections across the biographies and using them to compare/contrast the people we read about. 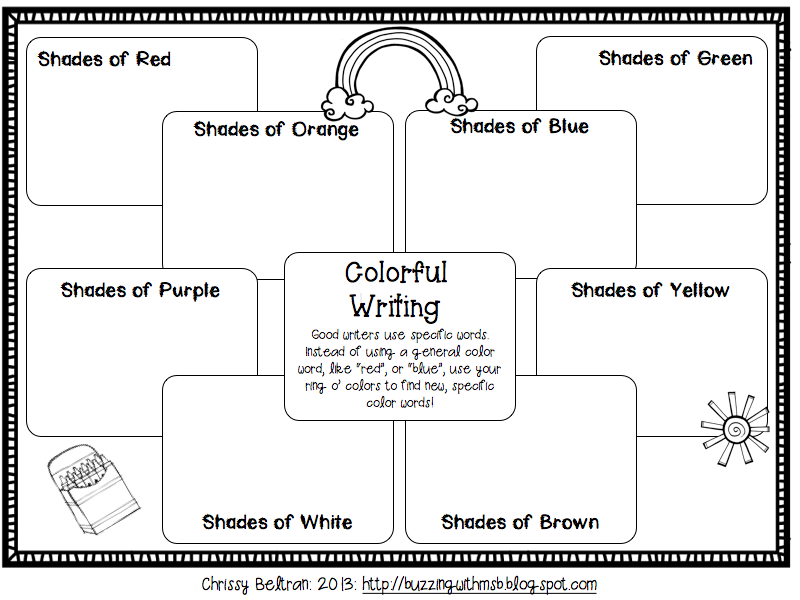 Check out this post to see the matrix we used to connect across biographies! 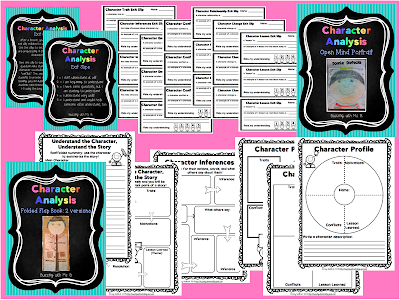 Click over to check out the full 41 Character Analysis Tools Pack! 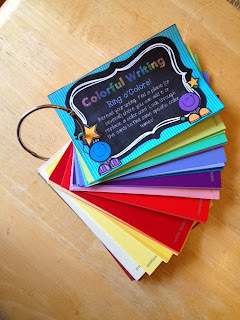 Stealin' Paint Chips from Wal-Mart - Writing Freebie! About a month ago, my fourth grade teachers and I went to an Empowering Writers training at our local service center. It was a great training for expository writing, and my teachers walked away with a lot of strategies and tools. One specific tool the trainer shared, which I've seen before on pinterest in various forms, is using paint sample cards to help students expand their color descriptions. 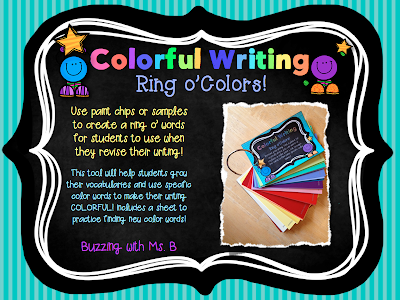 Our trainer said we should go to the store, steal a bunch of paint chips, and put them on a ring so students can use them to find specific color words. Rather than saying "red" or "blue," they can say, "pomegranate red," or "cold cobalt". So today, after I got out of school, I was feeling charitable. 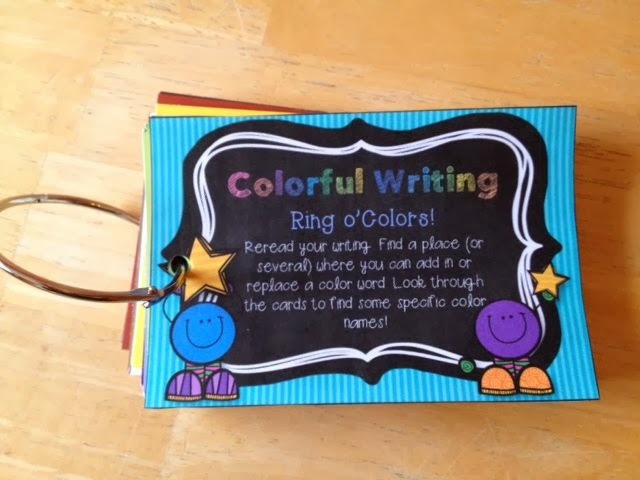 I left early and ran by local Wally World, thinking, "I'm going to take a bunch of paint chips and make the rings for my teachers during my week off!" This was easier said than done. Mostly because I am afraid of getting in trouble know it's wrong to steal. Feeling guilty already about my plan to steal samples with no intention to purchase paint, I went to the hardware section and was pleased to see that it was empty. Just like when I need help with something, no associate with an "Ask me, I can help" vest was to be found. I started out with the shades of blue and purple. I grabbed "royal amethyst" and "true turquoise" paint samples in bundles of seven (one for each teacher). My stack began to grow as I added in "pale hyacinth" and "feather teal". At this point, I realized I had quite a stack, so I stuffed it into my purse. I gazed around nonchalantly, trying to channel "I'm just browsing for the perfect bedroom color," I looked left and right. There was no associate in the vicinity. I did see several shoppers, though, and their classiness (this store is known for its classy clientele) deterred me from theft for a second. By which I mean I knew they knew exactly what I was doing: stealing. Oh, well. They knew. I knew. We all know. Grabbing large chunks of yellows: canary cream, dusty daffodil, and honeyed honeysuckle joined the bundle of contraband in my purse. I began to really feel guilty. I looked around and saw a blue vest in the distance and decided to take a walk around the aisle. Pushing my cart and my purse full of thievery, I took a few steps down the aisle and pretended to think about surge protectors and extension cords. After I made a full circle around the aisle, I again stopped in front of the paint samples and proceeded to gather browns, beiges, and greens. Sea foam and fresh-cut grass were added to my stack, along with bubblegum pink and shades of rose. And then the phone rang. It was a sudden ring, from right behind me. The empty booth, designed for an associate who should be giving me the evil eye right now, was still vacant, but the phone was ringing. It was ringing for me. It was ringing because I was a thief. I shoved all the paint samples in my purse - the stack was about five inches tall by now - and started to turn my cart to leave the section. And then a voice came over the public address system. "Someone in hardware, please pick up line 2." AAAAAAA! I thought. They're calling someone to the hardware department to tell me to stop stealing their stuff! I walked quickly, clutching my guilty purse, darting across the store. "If I can only make it through the checkout before someone tells them I'm coming!" I thought irrationally. I stuffed my scarf into my purse to make sure no paint chips crawled out to declare my guilt. I found a magical empty checkout lane (I know - an empty lane in Wally World? It had to be a trap) and raced to the counter. I couldn't make eye contact with the cashier, becuase my tell-tale heart was beating from inside my bag. "Did you find everything you were looking for today?" the cashier asked me. "Yes," I squeaked, barely able to keep myself from blurting out, "I'm sorry! I'll never do it again!" "Have a good night," she said. I didn't deserve her graciousness. "Thank you," I said, as I dragged my bag o'lies out of the store. I didn't feel completely comfortable until I was sitting in my car with the door closed. 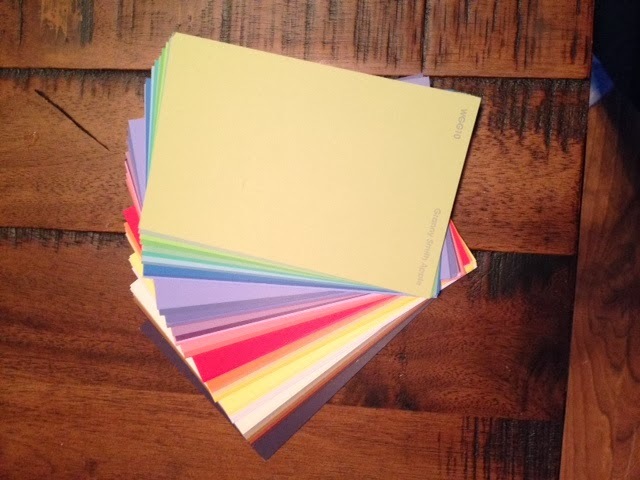 I opened up my sack and shuffled through my purloined paint colors. 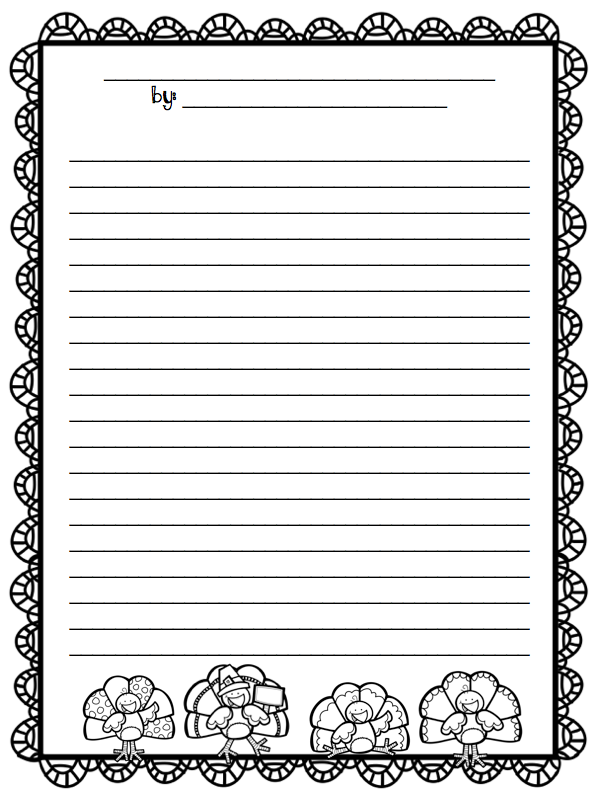 The kids will never know what we do for them. I risked my freedom for a stack of colorful cards in colors I will never really use. 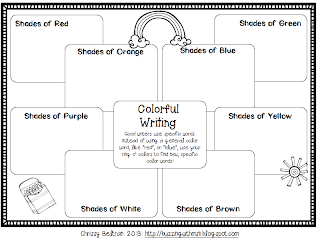 All of this being said, if you are brave and would like to go steal paint chips from your local one stop money trap, here's a handy dandy printable you can use to make your own Ring O' Color Words! 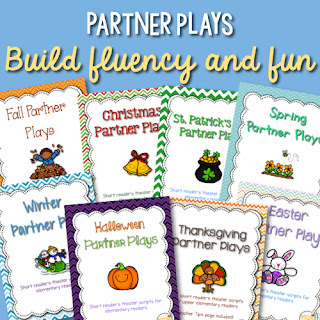 Grab your freebie at TPT! Literary Nonfiction: what's important in a biography? 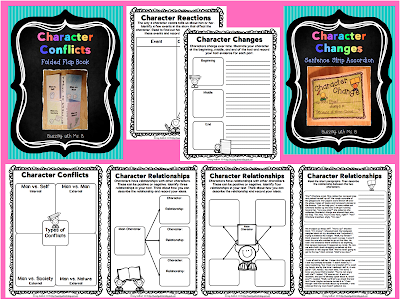 Our big focus for reading this year has been to identify the important characteristics of a genre in order to help our students know what to look for in each genre. 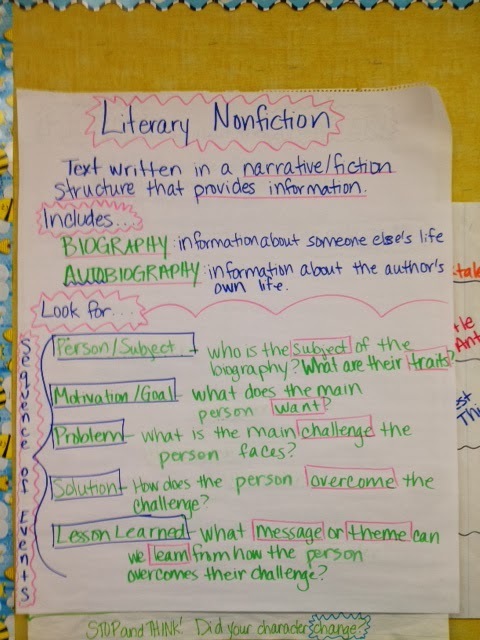 Our current unit of study is about Literary Nonfiction. 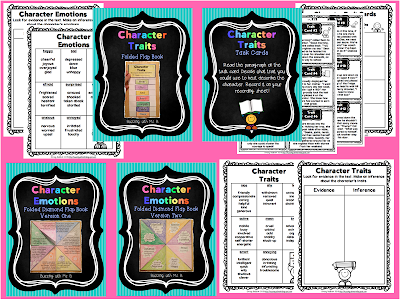 We are teaching most of the unit through biographies and autobiographies, because they meet the criteria of literary nonfiction: text that provides information but uses literary devices, such as descriptive language or a narrative story structure. 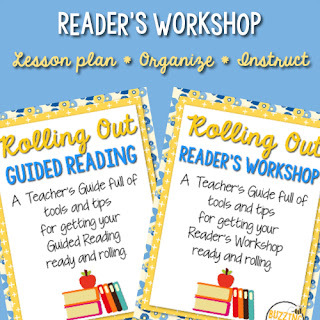 This can be a difficult concept for readers who are new to this genre! It's a crossover genre, and it contains characteristics of more than one genre we are familiar with. In the upper grades (2-5), we planned a unit in which the teacher reads several literary nonfiction texts and looks for specific things in each one, and then adds them to a matrix to help students make connections across texts. - Who is the subject/main person? - What are their traits? - What are their motivations or goals? - What challenges does he or she face? - How do they overcome the challenge? - What lesson can we learn from their life? and Snowflake Bentley - one of my favorites! 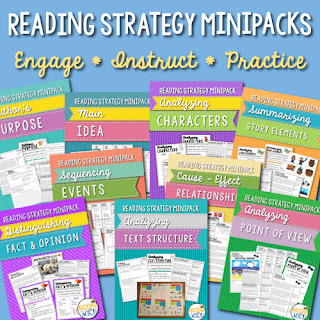 It's especially difficult for kids to understand and decide on a lesson, moral, or theme for the text. 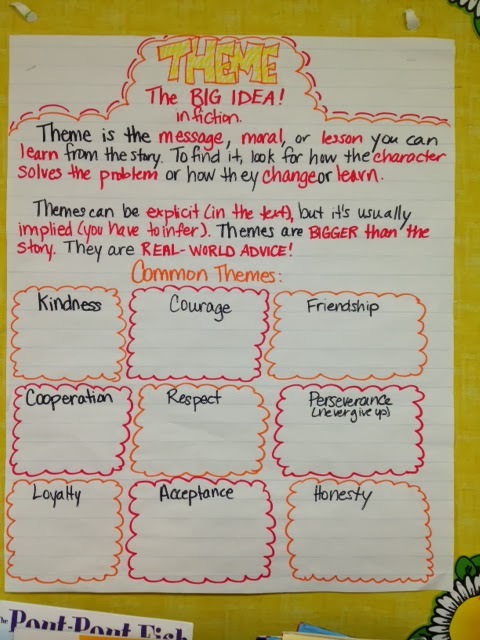 Our teachers worked on the theme as the learning that the character does or the reader can do as a result of how the problem is solved (or challenge is overcome). 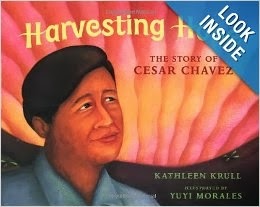 Question for you: Which biographies do you love to read with kids? Which have the best messages for us to learn? Today is just a mini-post! I wanted to share some of the Thanksgiving themed products I've put together in case you're a-hunting for some cute stuff for this week! I say this week because in my district, we get the WHOLE WEEK OF THANKSGIVING OFF!! Yes, the whole week. This is excellent, because it gives me enough time to put up all the Christmas decorations and often even wrap some of the Christmas presents I compulsively buy throughout the year! 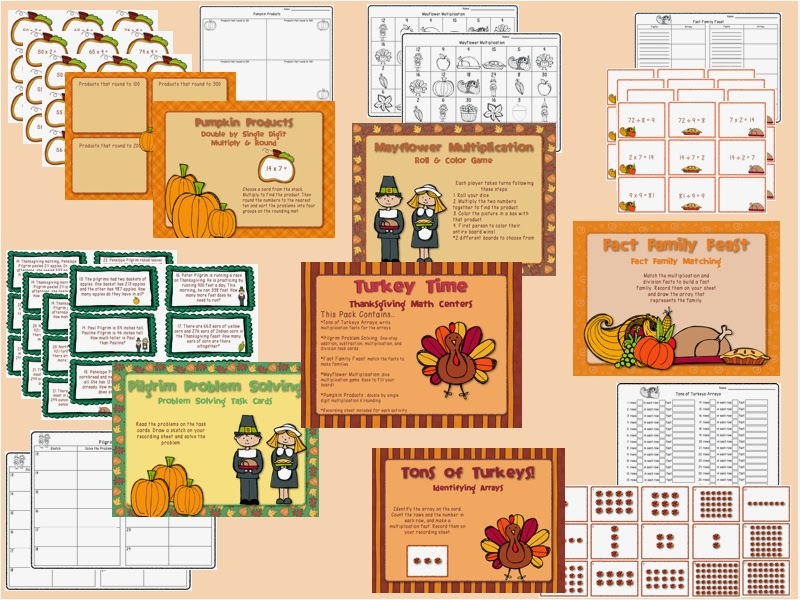 Anyway, take a peek at some of the Thanksgiving products you can find at my TPT store: Buzzing with Ms. B. I've got the hook-up for reading, writing, and math during the last week before Thanksgiving. 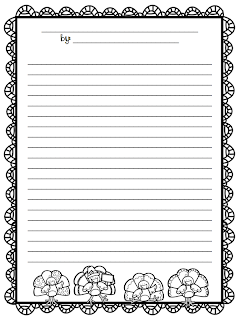 Looking for some fun word work! 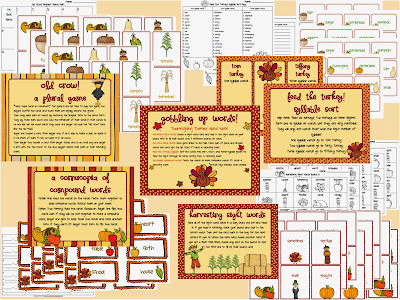 Check out Gobbling Up Words and help your kids work with syllables, plurals, compound words, and sight words! Math is more fun when turkeys are on the menu! Turkey Time includes problem solving, arrays, multiplication facts, fact families, and more. 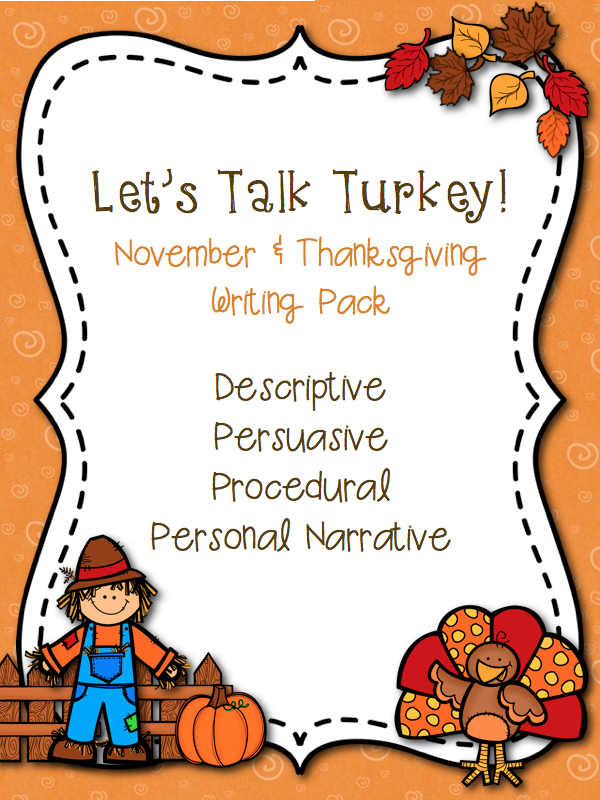 And for some engaging writing activities to get your kids' creative brains churning, check out Let's Talk Turkey for interesting materials to teach writing in four different genres of writing! Oh my gosh. I have so much to tell you that I don't know where to start. In the month and a half since I last really blogged (two weeks before my wedding and the month since!) a lot has happened. - It is getting dark early and this causes me issues with my emotional health. - All things pumpkin are available and this causes me issues with my eating habits. - Christmas is coming and this causes me issues with my finances. In short, I have issues of the seasonal variety. 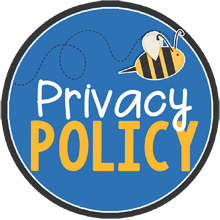 But, in spite of ALL THESE ISSUES, I have lots of school stuff to tell you! I'm really going to try to stay focused with this post, even though I am muy excited about a lot of the new things we've done this year. 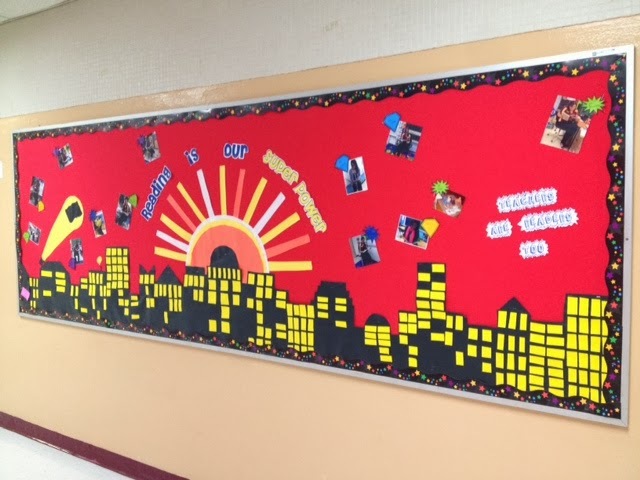 Our theme this year for reading is Super Readers: Reading is our Superpower. We have tried to weave this into lots of different initiatives on our campus, including our family literacy night and the 25 Book Campaign. 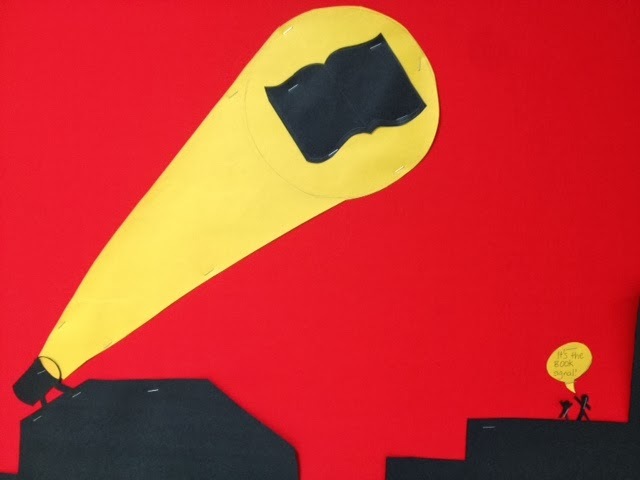 At the beginning of the year, my librarian and I decided to do the superhero theme and so I scoured (where else?) 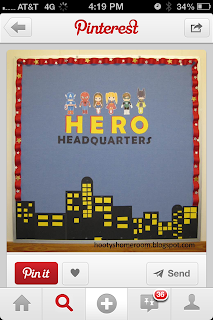 pinterest for superhero ideas! I found a pin about a superhero bulletin board and I thought, "I could do that. 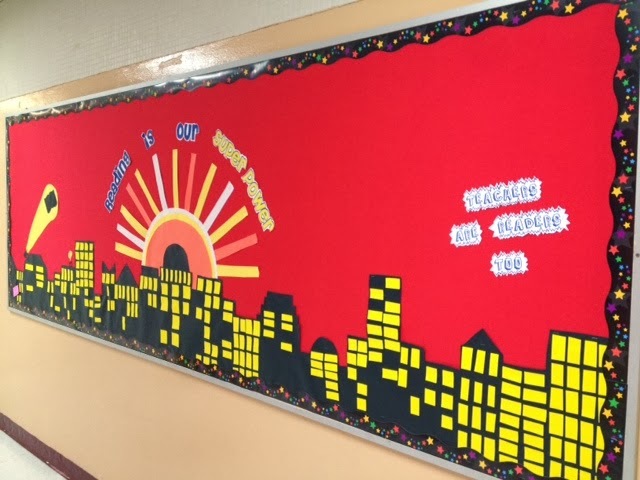 I can easily make a superhero bulletin board for our main hallway. 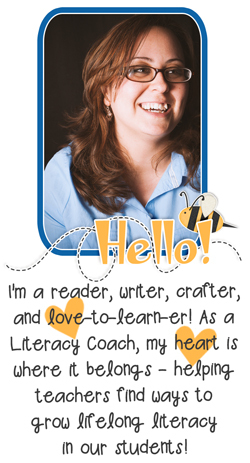 I will ask teachers to contribute pictures of themselves reading and put them up. This will be fun." This is the finished product! I will share with you how my masterpiece came to be. Unfortunately, it's just linked to a google images search. The bulletin board in the main hallway was already covered in red fabric. I took the black and I unrolled a large sheet. I crawled around the floor and sketched the shape of the buildings and then I cut them out in one large piece. 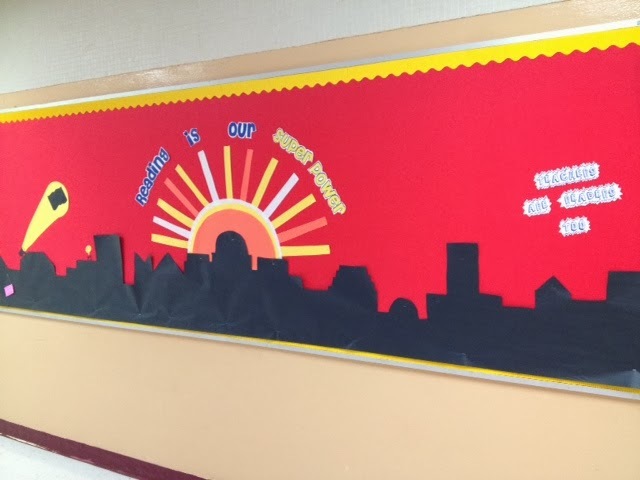 I cut out the letters and a sunset as well. And then I got to staplin'. This didn't really take a long time. I stapled it here and there and added the sunset in the background. And then I got a little excited about some details. In case you can't read it, the people are saying, "It's the BOOK signal!" I know. I'm dorky. My husband already made fun of me, so please don't feel like you have to contribute. I added the sign (so important, I know) because details are important to me. I'm not really sure that any child has even read this sign, but I do every time I pass by and it makes me laugh. So at this point, I realized I needed to add yellow windows. I went back to my classroom and cut up a bunch of yellow paper into rectangles and squares. I grabbed several glue sticks and a rolling chair and went back to the board. I started on the right side (you can probably figure that out, actually, when you see how many "lights are on" on the right side versus the left! I glued the yellow squares to the buildings and scooted some more and glued some more. I had been glueing and scooting for about eight minutes when I began to ask myself whose stupid idea this was. I mean, who hand-glues on ALL the windows in a WHOLE CITY?! I kept glueing, and people kept walking by saying things like, "Almost!" and "That's a lot, Miss!" After about fifteen or so minutes of glueing and scooting, the town of Readopolis was pretty well lit (good enough for who it's for, my mother always said). Then I petitioned the teachers to send me pictures of them reading! 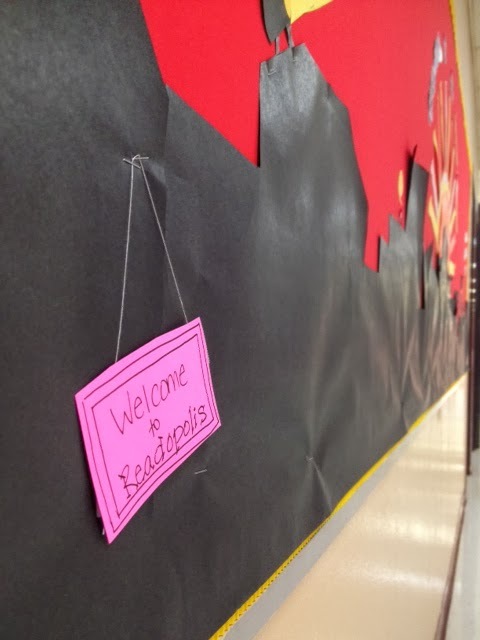 I've been adding them as they come in, and I also am beginning to add pictures of kids reading around the school, too. We are super readers! 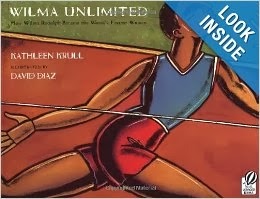 We are continuing this theme throughout our reading program this year! 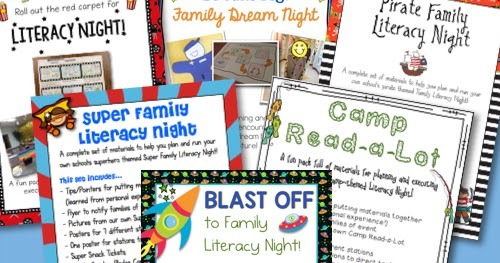 Check back soon to read about our superfun Family Literacy Night!